After riding for almost 7 years in and near Tokyo, it is easy to ride down a road and assume that you know it -- that there is nothing new to learn. I still cannot imagine that we rode all those years until Hiroshi Koyama showed us the forest road along the North shore of Tsukui-ko, the Tank Road and One Kansen doro -- a very nice alternative for getting in and out of the part of Tokyo where I live. It was a spectacularly beautiful day ... but I did not bring my real camera. This taken with Blackberry at Yakyutei after lunch, in Okutama. 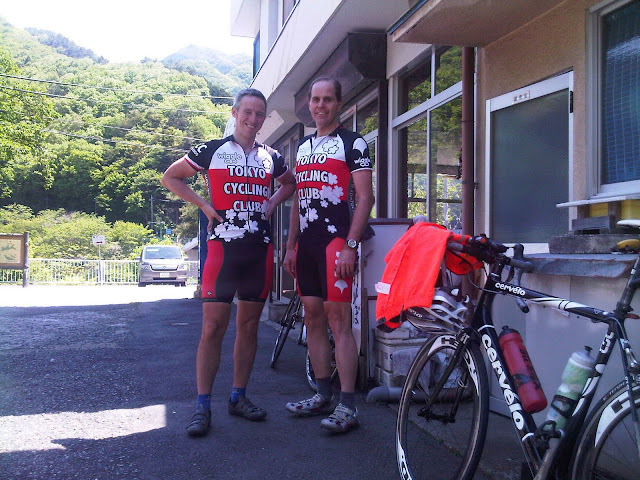 Today, I rode with Steve T., who started exploring the areas near Tokyo well before I got my first nice road bike or moved to Japan in 2004. He showed me a thing or two on some routes that I thought I knew. We had been cautioned by Machin-sensei that this close before Tokyo-Itoigawa we should keep our rides short -- 1 hour at lactose threshold, followed by quick carb loading. But it was a gorgeous day, and I guess in the end we thought the psychological damage of not enjoying a nice ride today amidst the green of the mountains would offset any benefits from retaining our glycogen stores for next Saturday. So when we met at Takao, we decided to compromise -- no mammoth ride, certainly, but a trip out Route 20 to Uenohara, then up to and over Tsuru Pass, then via Okutama-ko back to Oume and a train home. For me, 130 km, and 1300 meters of climbing. And, of course, we decided to go at a relaxed pace, not pushing to hard. We kept faithful to that last decision for at least 2 minutes. Right out of the gate, we were riding behind a strong Japanese rider in a white Castelli jersey. He set a fast pace and we stayed with him, until Steve decided to zip past him just as the climb inched up from 3 or 4% to a 5 or 6% grade. 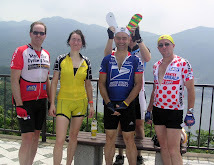 I stayed with him a little longer, eventually slipping back, but nonetheless was able to pass a gaggle of Japanese riders on the climb, and climbed Otarumi as fast as I ever have. Better yet, I was well above threshold during the upper part of the climb, so this did not even start to count against my one hour time limit for riding at threshold. (Err, ... please forgive me if I misunderstood the instructions). At Uenohara we headed NW on Route 33. Steve volunteered that we should take the smaller road on the East side of the river. I said "great, you mean Ludwig's route". He took offense at this -- claiming to have discovered it long before the days of GPS navigation, when exploring on his mountain bike. 3/4 of the way up to where it ends at Route 18, we crossed a bridge and he pointed, "the road used to go over there, but for some reason they built this wide bridge, even though the road narrows to a goat path just around the next corner." Indeed, it did. As we climbed up Route 18, he suggested another alternative "why don't we take the road that curves around and skips the first pass (Tawa Pass). We did so, climbing up a delightful valley, then past at least 5 barking dogs in cages behind lock and key, and to rejoining Route 18. Steve said that he discovered this side road when he still rode mountain bikes, and had publicized this alternative within TCC last year at the end of one of MOB's sayonara rides. 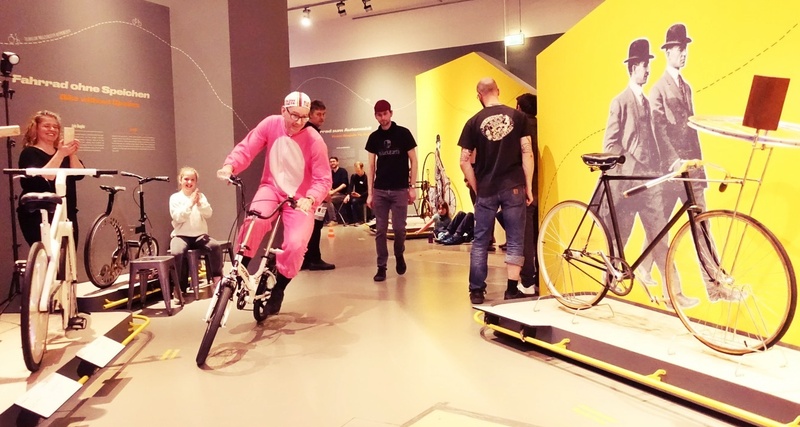 Tom, Ludwig -- have you ridden this route before? If not, check out the GPS track carefully. It may even be a short cut -- saving the climb over Tawa -- and is a delightful alternative. We passed a field on a ridiculously steep slope down to our left, and Steve pointed out the little old lady at work, hugging the steep ground and tending her crops. "She is there every time I pass by, whatever the conditions." I checked again to make sure it was not a scarecrow -- indeed, a real person. Then the last climb to Tsuru -- I let Steve go ahead (not that I had any choice ...) and finally concentrated on staying at a reasonable heart rate -- in the 149-151 range at threshold -- despite the steep climb. Then it was down to Okutama for lunch at Yakyu Tei. I've never seen it so full, big groups of people, motorcyclists, car tourists, cyclists, and locals. Watanabe-san's helper snuck us some bananas for our ride home, just to make sure we knew that they appreciate the regulars more than these "fair weather" customers. As we descended Route 411 and passed the traffic signal in front Okutama Station, Steve asked if I had been to the "foot onsen" nearby. I did not know it existed. Instead of entering the next tunnel, we veered to the right and followed the road that goes around the outside of the hill -- and I noticed signs to Moegi Onsen, with other signs for "ashi no yu". There was a very nice facility -- on the right side, a day onsen, with about 50 backpacks lined up outside, the whole group trying to get clean following a hike. On the left, a little house where you could buy a 100 yen ticket, place your shoes in a box, and sit with your feet dangling into the hot water. Ahhhh. Steve mentioned that the river is very nice down the slope nearby, with kayaking and some camp areas as well. The foot onsen was a nice interlude from hammering away in cleated cycling shoes ... but not so relaxing as to make it impossible to get back on the bike and make it down the hill to Oume Station. As I rode the train home, I realized it was one year ago this weekend that I broke my elbow/ribs and missed Tokyo-Itoigawa. This time, I made it home in one piece and am ready to go! David, great minds think alike: I too was out over Tsuru, starting Onekan/ forest road/ golf course hills/ mistake back to uenohara and therefore up route 33 before hitting 18, over and down past the primitive village and back by train from Ohme. The landrover on the forest road is not there! I repeat; it has moved. This will shock and awe positivistas across the globe I am sure. I will post photographic evidence later. WHAT ???????? The Landrover is gone??????? This is unbelievable. Please send hard evidence ASAP. Japan ist changing these days and not for the better!!!!! David, great ride and great report. Really glad we went up Tsuru (so beautiful) and also pleased that we had the discipline to keep to James M's advise of short one hour rides touching threshold... we just decided to do four of them in a row, that's all ! As for the Land Rover, I think I have seen it gone once before - aren't cars there to be used at least every now and then? Okay, okay, you have been everywhere. We yield before your logic. But the route between Uenohara and Rte 18 will henceforth be referred to as "Steve's road", and the Tawa bypass will be, well, the "Tawa Bypass." Yes, cars are to be used, but the longer a car sits outside, the more difficult it is to get it to actually go. With me, in Tokyo, this is primarily a battery issue -- 3 weeks without use and my car battery is dead. I once had the use of and responsibility for an old Saab -- though not as old as the Tsukui Land Rover -- in Chicago for a year when its owner was on a Fulbright Fellowship in Istanbul, and with an older car, such issues are not limited to the battery. (Of course, the cold weather made it much worse, and Tsukui would be gentler on a car that Chicago.) The tires started to go flat after a few weeks of inaction. The electrical systems generally declined. It was a real struggle to keep it running. So in my view, even though I would expect more from a rugged SUV in temperate Tsukui, no, the Land Rover is not to be used. It is as good as a movie prop, perhaps without even an engine inside its hood. Maybe it was taken to Tohoku by a charity for use in photos of the various relief missions? Good find Ludwig ! I'd wondered what was up that turn-off from Rt30 but was always too exhausted by that point to even think about trying it. Will definitely try it next time I'm out that way if I can muster the extra energy.